When Should I Hire A Consultant? Bringing in a consultant into your Dental Office is a big, big decision. Firstly, for the Dentist, it can feel like an admission of failure. After all, the dentist has gotten the practice to the level of “success” where it is today, why can’t he keep it going? Or it could be that the Dental Office is in such a messed up state that the need to engage outside help is imperative to untangle the knots and get the place organised so it functions efficiently? Or it could be before the fact. I often see dentists gathering knowledge in preparation of establishing a new office, or a larger office. And it’s an extension of the old timeless adage that “two heads are better than one”. Dentistry is a different type of business to most other businesses, in that the business owner dentist has his back to his employees for nearly all of the day. While the dentist is doing the dentistry, he’s unable to supervise, observe, and advise his team on systems and processes necessary in the way to run and improve his business. In retail and in restaurants, for example, the owner has the opportunity to “walk the floor” and supervise the machinations with a tweak here and a tweak there. Suggestions can be implemented instantly, and better still, behaviours can be complimented during the fact, rather than after the fact. Changes and suggestions are only ever made after the fact, and then reviewed later on, after the fact. This can make improvement much very difficult to achieve. This is where hiring a consultant can be invaluable. Hiring outside help tells the team that you’re serious about improvement and growth of your business. The team knows that outside help has a reasonable fee, and so they understand your investment in advice is a commitment to improvement of both them and the business. And improvement of you too. But sometimes there is angst. You see if all businesses were smooth sailing there’d never be a book published on business, ever. But go into any airport bookstore and there are nearly as many business improvement books as there are fiction books. And business books can be a good place to start. Because business books will always provide sound principles for your business. It’s simply a matter of sifting through the advice. But it should be all there in black and white. To me there’s a difference between owning a book, and receiving the advice in conversation and discussion. Because there’s no debate with a book. A book doesn’t know the why of your business. But the right outside help can and will draw out that why. Sometimes a few small tweaks can really undo the kinks in a business to release it to a whole new level. And sometimes there are serious tangles that need surgical precision to straighten out. The right outside advice will straighten out these kinks and tangles. The right outside advice is imperative to future growth. But the advice needs to be right for you. As a golfer I’ve worked with coaches that have succeeded in improving my game. And I’ve worked with others that have not. And I’ve worked with some who have succeeded and then later down the track not had success with me. But I know, to improve at golf, I need outside help. I can’t improve to where I want to be on my own. Rory McIlroy has a coach. The Denver Broncos have a coach. The Carolina Panthers have great coaches. I know that each of the three times that my Dental Practice experienced significant spurts of growth corresponded to me seeking and employing outside advice. The decision to hire outside help is a big one. My upcoming two day workshops will be held in Manhattan in April. Is Your Dental Office Dishing Up Just Plain Old Vanilla? Last week I travelled interstate to visit a client. When I booked my accommodation on line, I had the option of staying at a serviced apartment, or for only $100.00 per night more, which included my breakfast, I had the option of staying at a boutique luxury hotel just five minutes walk further away. Firstly, there’s an important lesson to be learned right here. When discussing the price, or the fee for something we are purchasing, we must consider the base price and then the *DIFFERENCE* in price, rather than only looking at the whole price. I do this also when renting a car. The difference in price between renting a small car and a larger car may not be that great. But the peace of mind I feel when I’m driving on a freeway in a larger, safer car is priceless. For only a few dollars more. It’s the same with restaurants. Sometimes the *difference* in price between a meal at a regular diner, and a meal at an upmarket steak house is not that big a difference. And come to think about it, you have to eat anyway. The cavity needs filling anyway. Do your patients hunt around for the best rock-bottom fee they can find, or do they feel value in the service and experience they receive from you, so that the *difference* in your fee is of no consequence really? So let me tell you what else I received at my boutique hotel. When my taxi pulled up just after 11:00pm, I was immediately welcomed and greeted by a professionally dressed female hotel employee who helped me unload my small suitcase and then waited for me to settle with my taxi driver. When I entered the hotel and approached the reception desk, another female employee greeted me by name, although I had not offered that information about myself to anyone there yet. Are we using this sort of power in our Dental Office? Are we taking the opportunity to greet our arriving patients by name, when they arrive, before they have the opportunity to volunteer up that information? After all, we already have their name and booking in our appointment schedule. Why not use this information to make an indelible impression, especially on those clients visiting us for the very first time? And if we can’t greet our patients at the door as they arrive, do we have the opportunity to stand, and walk and welcome them on their side of our reception area? Rather than staying seated, awkwardly, behind some fancy reception desk upstand? Once my documentation was completed, one of these two female employees walked me to the elevator, pulling my suitcase, and took me up to my room, where they then explained some of the features of my room. She also told me that the front reception area of the hotel was attended 24/7, should I need anything at all. Do we do that in our dental office? Do our reception staff avail themselves to the patients on a 24/7 basis? Most dental office staff slip back to hiding behind their desks. How powerful would it be to offer the patient a tour of your dental office before their treatment begins, and then offer them the ability to contact any of your team 24/7 should they have any reason whatsoever? We know that hardly any patient is ever going to abuse this offer of access. And yet the power of the offer is again priceless. I call this an *Offer The Offer*TM type offer. This is where the power of offering the offer is several order of magnitudes greater than the offer itself. What other times during the patient visit do we have the ability to offer them an *Offer The Offer*TM type offer? Finally, my room was well presented, and there on the centre table was an envelope, along with a welcome gift of a locally produced non-alcoholic wine. The bottle was accompanied by a small explanatory card. The separate envelope contained a handwritten card welcoming me to the hotel and reaching out to me should I need to request anything at all in order to make my stay more comfortable. It was signed by the hotel manager. How often do we offer a welcome like that to our patients? How would our new patients feel if they were greeted with a handwritten welcome card from our dentist, rather than simply being slapped with a clipboard? At breakfast the next morning I asked for a dish that was not listed on their menu. I asked if it was possible to order the eggs benedict, but be able to substitute some smoked salmon in place of the regular ham. This was not listed as an option on their menu. What a welcome, pleasant surprise. In the past, when I’ve needed to ask for this option in other hotels I’ve been greeted with many different reactions ranging from a flat out “No”, to a “let me go check”, to a “yes we can but it will be $5.00 extra”. It was obvious that this hotel had rehearsed and trained and anticipated all possibilities of non-regular breakfast requests. For the extra $100.00 per night I was reminded of several invaluable lessons that are just as applicable in a dental office as they were in this hotel. And this is why I made the booking here rather than at the serviced apartment. Because I knew there would be a significant difference. It doesn’t take much to go from average to good and from good to great when it comes to service. What it does take is a commitment to carry through with those necessary improvements on a regular and consistent basis. with monotonous regularity throughout my visit. But if they do indeed do the things I suggest, why are they not doing them when I’m there and why has their employer sought to bring me in in the first place? There are always lessons in service to be learned all around us. Are you looking out for these lessons? And are you able to take advantage of them? Or do you need some professional assistance in making the necessary changes at your office? 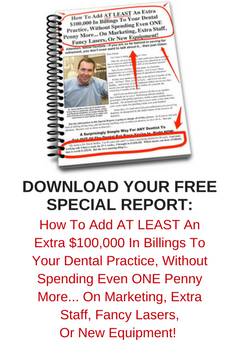 Changes that will take your Dental Practice from good to great…. Three Cases Of The Tail Wagging The Dog…. It truly is a case of the world gone mad. Three dental employment stories that came across my desk this week just show how skewed the law is when it comes to employee rights. As you read these stories ask yourself how much ire would be raised if the roles were flipped. I’m going to tell you tales where the employer is left high and dry by employee choices, but if the roles were flipped then all hell would break loose. A dentist I know received a letter of resignation from his associate dentist, despite the fact she was only part way through an agreed two-year contract of employment. The associate dentist resigned giving one months notice that she would not be seeing out her two year signed agreement. Apparently the associate dentist had been accepted into a university course that she had applied for, despite her obligation to her employer. Seems the associate dentist had not thought it necessary to let her employer know of her aspirations, until after she was accepted into her university. How would the associate dentist have felt if the employer had been the one to terminate their two-year agreement early? Another dentist I know received a “Dear John” email from a receptionist who she had employed for the past two months. Well not only employed, but trained, and educated, and motivated into how to provide ultimate results and conversions when the Dental Office phone rang. Just an email to say “I won’t be in on Monday, I’ve taken another job with a dental specialist”. It’s always disappointing to put in all that effort to train your team and educate them and then have leave. But what is even stupider is never training your employees and having them stay. Again, what’s disappointing is the brevity of the notice. It would make front page of the newspapers if a dentist sent an email to a team member saying they don’t want you to work there any more, from tomorrow. A dentist I know very well works part time as an associate dentist in a couple of dental offices. At one office, he had an appointment to issue a crown for a patient. As is usual and customary for him, he numbed the patient, waited for the local to take effect, and then removed the temporary crown. It was at this point that his dental assistant there advised him that the crown to be cemented had been misplaced, and now could not be found. This “missing” crown had been returned from the lab a few days prior, been sighted at the practice, but had now been misplaced, and was nowhere to be seen when the patient arrived. In fact never to be found again…. The sad part of this tale was that the dentist treating the patient was not made aware of the fact that the crown was indeed missing, and was not informed by the staff, and was so left to wear the “egg on face” with the patient after numbing the patient and removing the temporary crown. Despite all the reasonable checks and balances at this practice, it was decided by some to pass the buck to the assistant dentist to fall on his sword. Surely the dentist needed to be told of the state of play at the morning huddle as well as again just before the patient’s appointment. Again, what if the dentist had messed up something and asked the dental assistant to take the rap with the patient? My understanding was that the assistant dentist was very civil and circumspect while explaining the story of the lost crown to the patient. And to make matters more awkward, the patient was a recent new patient to the practice who had just recently become very comfortable that he had finally found a great dentist. Like a true champion of customer service, the assistant dentist refused to publicly lay blame, though he well could have, in this situation. Instead, he took the blow on behalf of his team. Obviously nobody misplaced the crown on purpose. It just would have been more appropriate for the patient to have been advised of the situation at a better time than mid-appointment. The road of being an employer and a business owner is a difficult one. Despite all attempts to make life a course of smooth sailing, there will be curve balls thrown at unexpected times that we need to be mentally prepared for, just in case. The business of dentistry is so complicated when it comes to the blend of personalities, duties, and skills. And most of the time this is true.. But there are times when nice needs to be packed into a box while work needs to be done. There needs to be a turning point during the patient’s visit where the pleasant talk is replaced by serious treatment talk, so that the patient understands their dental reason to return. Transitioning the conversations to do this is an art that the entire team can learn, and control. And a good team will know when it is the right time to turn on the charm, and when it is the right time to roll up their sleeves. And they’ll know these times and these roles down to a tee. For example, it’s not appropriate for the receptionist or scheduling coordinator to enter into a sociable conversation with the patient as they are being handed over at the front following hygiene or following treatment. This is a no social time zone. The purpose of this handover is to cement the need and the urgency of the next phase of the patient’s treatment. And social at this time is purely a distraction to the purpose of the protocol needed at this time. And that purpose is to create the Clear. Next. Step. for the departing patient. And at this point, having someone launching into a discussion about last night’s “You’ve Got Talent” TV show is probably going to present an unnecessary major detour and distraction inside the patient’s mind. So it’s imperative that all team members, no matter how blessed they are with the gift of the gab, know when it is time to speak social, and know when it is time to zip social. They all need to know what topics and what genres need to be spoken when, as well as when not. It is the same down in the hygiene room. It’s great having a friendly and sociable hygienist, but when it comes to the time to discuss treatment, next appointments and urgency, then everyone needs to know that this is a time when the social needs to be switched off and the patient’s health, as a subject, needs to be switched on in total focus and isolation. I’m a firm believer in the choreographed one-two team examination in hygiene, where the hygienist has finished everything hygiene with the patient before the dentist comes in to do the restorative exam. In this way, the dentist and the hygienist and the patient can focus totally upon the restorative needs, without the distraction of returning to a “hygiene moment” straight afterwards, and in so doing losing the moment with respect to the urgency and necessity of those restorative matters. And the dental practice is no different. Successful case presentation, treatment planning and treatment acceptance is not something that needs to be put down to chance. Every patient needs to have their diagnosed treatment completed. Having the team working together as a team helps to ensure that more treatment gets understood, and therefore completed, rather than delayed. “Turn! Turn! Turn! (To Everything There Is a Season)”— is a song written by Pete Seeger in the late 1950s. The lyrics, except for the title which is repeated throughout the song, and the final verse of the song, are adapted word-for-word from Chapter 3 of the Book of Ecclesiastes, set to music and recorded in 1962. The song became an international hit when it was covered by the American folk rock band The Byrds, reaching #1 on the US Hot 100 chart in December 1965. In the U.S., the song holds the distinction as the #1 hit with the oldest lyrics (Book of Ecclesiastes), theoretically authored by King Solomon. Did you like this blog article? If you did then hit the share buttons below and share it with your friends and colleagues. Share it via email, Facebook and twitter! Would You Run Off With Your Best Friend’s Wife? I was reminded this week about an old business subject that I consider to be a “taboo” subject in dentistry. And that’s the concept of stealing or poaching staff from other dental offices. I’ve a theory that this sort of behaviour is fraught with danger. A theory, that in theory, this may look like a great idea, but the end result is often tears. The reason that I was reminded of this thought was because this week a colleague of mine experienced an act or request of poaching. And you know sometimes in life when you’re reminded about something that you think you’d “shut out” of your memory, and then all of a sudden someone reminds you of that horrid experience? And so a dental friend of mine was telling me about a team-training day that she recently attended, with her dentist employer, and the team, where the team had to travel to be trained. At this training day the hired dental consultant asked my friend, on more than one occasion, if she’d ever consider relocating, to come and work for him? And this reminded me of a seminar I attended in 2002 where I took along my fabulous hygienist to a meeting that was primarily attended by more practice principal dentists. And on this day, the course facilitator mentioned privately to me, during a break, to be wary that my hygienist would become the target of offers of employment from other dentists attending. And sure enough, at the end of the day, my hygienist did report to me that she had fielded a number of poaching offers that day. It was a funny weird type of recollection, much like the golf memory I just described, because I remember that seminar, and that day because of a number of very positive and inspirational reasons and events that occurred that day. And so my friend’s very recent poaching experience, and my recollection of the “shut out” memory, raised the thought or belief in my mind about the ethics of the process of “pinching” staff from other dentists. I once saw the comment on a dental forum where a dentist suggested to a colleague to simply “go along to your competitor’s practice and offer his receptionist $5.00 more per hour to come and work for you”. Would that idea even work? Who would even believe that this was a viable long-term solution? And yet the comment was offered up in all seriousness. Away from dentistry for a moment, would you consider this would work if your girlfriend left you? Would you just go and “make an offer” to a girl in another relationship? Just because you were now available, and in your mind, you were a better prospect than the boyfriend she currently had? In my mind, if a girl was willing to boyfriend-hop to you, then I’d be thinking that once she found your weakness, she’d probably just boyfriend-hop right away from you at some later date down the track? And just like there’s right and wrong ways to go about employee replacing, there’s also right and wrong ways about girlfriend replacing as well. And I just would never entertain that thought. The world is a heavily populated planet. If you need staff, if you need a wife, there’s got to be someone out there in the big wide world to take the position without having to poach from someone you know. If you open a door, run up a flag, or run an advert, someone will come along. You don’t need to cut your neighbour’s grass. In the case of my friend, she felt the employment advances were out of place and kind of creepy. And I think it reflected badly on the poacher, as it should, and his image, in the marketplace. In my mind, there’s a right and a wrong way.